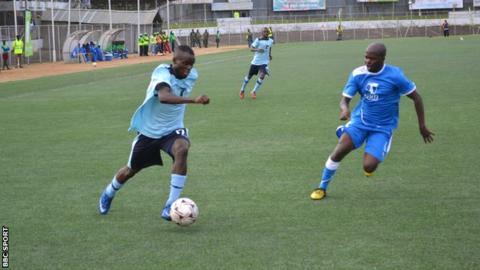 The first match between Silver Strikers and Mighty Wanderers to be played in front of supporters since the death of a fan last December, passed off without incident as the two sides faced off in the official launch of the 2014 TNM Super League season. Fans of both sides were involved in violent skirmishes at a league match that led to the death of a supporter, forcing the league's administrators to impose hefty fines and bans on the teams, although the Football Association of Malawi (Fam) reduced the punishments after a second appeal. Instead of a six month ban for Silver Strikers, the club was docked nine points for the start of the season, while Wanderers, who were earlier banned for four months, were docked six points. Silver Strikers and Mighty Wanderers replayed their match in February behind closed doors at Kamuzu Stadium where Silver, who needed just a point to be declared champions, went on to win 2-1. On Saturday, the two teams met at the venue of their last league meeting amidst tight security, where 100 police officers were deployed together with 50 stewards. A minute's silence was observed before the match in respect of the deceased fan, Lemiyasi Josita, who died, aged 31. Playing before a sizeable crowd, Silver Strikers started the defence of their title on a positive note with a 2-0 victory. A second half brace from striker Rodrick Gonani was enough to move Silver Strikers level on minus six points with Mighty Wanderers. After the match, Silver Strikers coach Stain Chirwa said the result was very important, considering it would take three wins for the team to start competing with other teams in the 15 team league. "Look, the result is a very good one because we started the league on minus nine points and we need two more wins to get to zero. "This should serve as a lesson to our supporters that violence has no good contribution to football. We are paying for the sins of our fans who today are not feeling the pain, but we are." Earlier in the week sponsors Telekom Networks Malawi (TNM) had warned that violence will not be tolerated. "For us violence is a no go zone and this means we do not want to put our corporate name into disrepute. "We will be forced to decide otherwise if acts of violence return to the beautiful game of football. The sponsors also announced the launch of an anti-violence campaign which will involve fans, players and officials.